Why learn by heart if you can cheat? 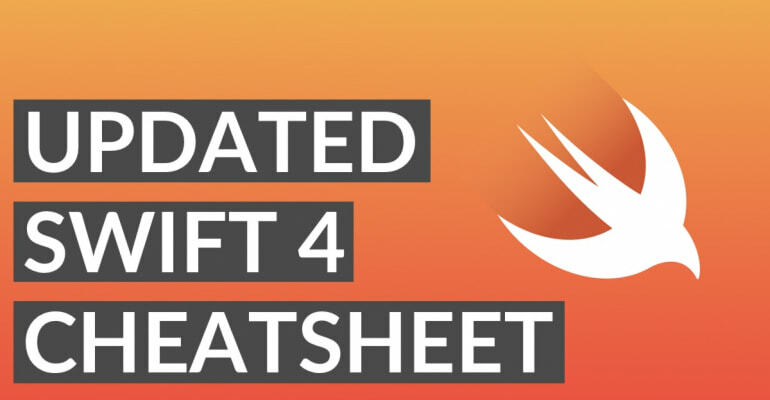 Grab my open source cheatsheet for Swift 4, including common syntax for primitives, OOP, closures, error handling and more! Good things happen when you work together! My Swift 4 cheatsheet is now open source. This means you can do with it whatever you want, as long as you keep the open source license intact. The most successful people I know share their work. As you’re learning how to code iOS apps, making this your practice is essential. Can you help? Contribute your Swift 4 code examples, tidbits and cheats by creating a Pull Request (PR) on GitHub. If you have an idea or found a bug, please share it by creating an Issue ticket. Why don’t you give the Swift 4 Cheatsheet a share right now? Compared to the previous versions of the cheatsheet, a lot has changed. It’s expanded, made clearer, upgraded and updated. We’ve added explanations alongside the code examples to help beginner iOS developers grasp Swift with a birds-eye view. Save the whales, the trees and the arctic, and don’t print out this cheatsheet! Simply save it on your Desktop and keep it open while you’re coding. Should You Learn Swift Or Objective-C As A Beginner App Developer?